First, upload a list of the recipients to SIGNiX. Then follow simple steps to add documents and then drag-and-drop signatures, initials and other fields right onto the documents for these recipients to fill out and sign. Once you hit Send, these individuals will receive emails letting them know where to view the document and will then walk them through the process to get the document signed. How Do I Sign Up for MassMailer? Contact SIGNiX (fill out the form to the right side of the page) for more information about how to purchase SIGNiX digital signatures or add MassMailer to your current license. Once I've Signed Up for MassMailer, How Do I Get Started? Log into your Document Center and create a new transaction. Dismiss the Add Party dialog by clicking the white X in the upper right corner of the dialog box. Choose the Mass Mailer button, and click Start. At the Import screen, tap Browse to locate the CSV file mentioned in Step 1 and click open. SIGNiX will verify if the CSV is formatted correctly and provide you with specific information if it is not. Follow the prompts to upload a new CSV if necessary. If there are no issues with the CSV, the screen will update to reflect all of the transactions. You can review these, if necessary. Continue by clicking on the Add Documents tab and upload one or more PDFs for each of the recipients to review, fill and sign, just like you would in a typical transaction. When you’re finished uploading, click the Add Signatures tab. The tool palette will show you ‘placeholder’ users depending on how many users your transactions include. Drag-and-drop signature, initial and other fields for each placeholder user just like you would in a typical transaction. When you’re finished, tap the Send tab. At the Send tab, you can customize the email message that gets sent to each participant alongside the link to their documents. You can also save the transaction as a template to be re-used by selecting the Save As icon in the upper right hand corner. Otherwise, when you’re ready, click Send All to start the Mass Mailer process. A confirmation dialog will appear to ask if you’re sure. Click Yes. How Do I Create the MassMailer CSV Import File? SIGNiX MassMailer uses a simple, easy-to-create CSV (comma-separated value) file to prepare the list of recipients, their email addresses, and authentication information. CSV files can be created in common spreadsheet or text programs, and can also be generated by many CRM and other systems. Click here to download a sample CSV file that you can customize for testing. Each line that follows this will generate individual transactions to be sent out by SIGNiX. “TransactionName” – REQUIRED - A unique Transaction Name must be provided which includes a differentiator for each transaction (preferably Name). If a non-specific transaction name is provided (ie. “Compliance” rather than “Compliance for John Smith”) – there will be difficulty in locating the transaction in the Document Center when the transaction is underway or completed. “firstname” – REQUIRED – First name of the reviewer / signer. “middlename” – OPTIONAL – Middle name/initial of the reviewer / signer. “lastname” – REQUIRED – Last name of the reviewer / signer. “emailid” – REQUIRED – Email address of the reviewer / signer. “servicetype” – REQUIRED – This value indicates how the signer will be authenticated (identity verified) before they are allowed to review and sign documents. Submitters typically choose one service type for all of the parties on the list, however, different services may be chosen for different parties on the list. Note that charges may apply for certain authentication services. The submitter must provide the appropriate information required by that authentication service type as described below. “SelectOneClick” – NO DATA REQUIRED – User is authenticated via email address and signs with a single click, followed by a confirmation step. If question(s) and answer(s) are also provided, then these will be presented to the user for response (signer must know the answer). “select” – SSN, DOB REQUIRED –The SSN is validated against the user’s name and the DOB is checked for 18+. If question(s) and answer(s) are also provided, then these will be presented to the user for response. A fee is charged per attempt. “SelectID” – SSN & DOB REQUIRED – User is authenticated through third-party knowledge-based authentication (KBA) via multiple choice questions based on 30 years of public database information. A fee is charged per attempt. “SharedSecret” – MOBILE NUMBER REQUIRED – A text message is sent to a user’s mobile phone containing a unique passcode. This passcode must be entered correctly before the user can continue to review and sign documents. A fee is charged per attempt. “dob” – REQUIRED for select and SelectID service types ONLY – User’s date of birth. Format: mm/dd/yyyy. “questions” – OPTIONAL for select service type – Questions that will be posed to user. Multiple questions can be entered, but must be separated by semicolons. For example: What color is the sky? ; What are the first four numbers of your account number? ; What’s your first name? Need a way to send all of the signed documents to a single point after they've been signed? You can now add a 'carbon copy' email address (or addresses) to the CSV. When each transaction is complete, a copy of the completed documents will be delivered as an email attachment to this email address. 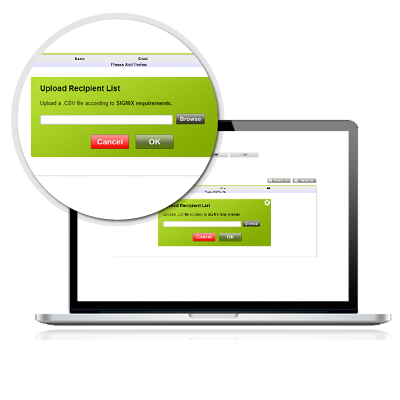 We even recommend that high volume users of MassMailer set up a unique email box for receiving these documents to better manage the flow. There are many tools available for Outlook, for example, that can package these attachments conveniently. In order to set up CC for a particular transaction, simply add an email address after the last comma-spearated value. No header is required. More than one email address can be used, simply separate them with a semicolon. NOTE: Do not enter data in columns /sections that are not required per the service type as this will flag the user for an error when imported. The error will be highlighted for the submitter to fix and a new CSV will need to be re-imported.